At the request of Fr.Anil Dev IMS, the founder of Vishwa Jyoti Communications, Mr. Moti Lal Gupta directed a play "Kaun Hai Zimmedar", an adaptation of "Raja Ka Baja". The first show was on 25th Dec.1993. 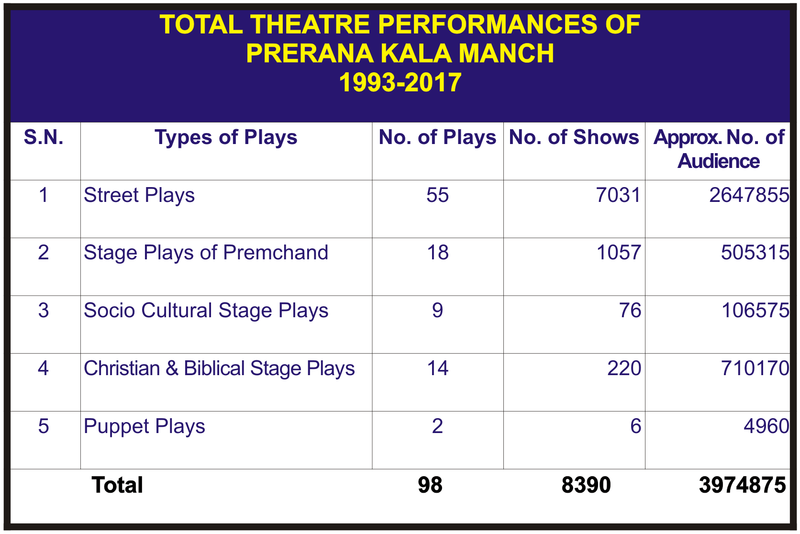 As per the records up to 31 Dec. 2013, Prerana Kala Manch has performed 6184 shows of streets plays on various themes and shows of Stage plays. Approximately 1842045 people have watched the street plays and people have watched stage shows. (Thus altogether people across the country have watched these dramas. To become creative and autonomous learners of the selected medium of theatre. To understand the potential of this medium. To master the technical skills and artistic elements of this medium. To eventually express one’s feelings and idea through this medium. To enable others to express in their own medium and language. To give fullness of life to the deprived and the marginalized poor of the vast Hindi belt by being with them in their struggle to obtain basic human rights. And thus to build a human community based on the values of love, peace, justice and collaboration beyond the walls of caste, religion, sect or gender.